The Indoor Range of Convex Mirrors from DuraVision™ are the perfect solution to eliminate blind spots in retail stores, reception areas, busy corridors and many other hard to see areas where collisions may occur or as a deterrent against shop theft. 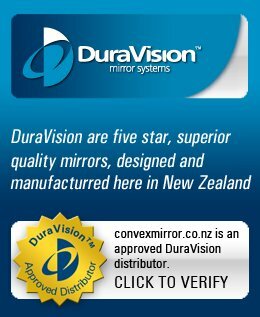 DuraVision™ Convex mirrors are specifically designed to monitor problem areas and allow staff to effectively monitor and observe areas which are hidden from view and also help workers avoid collisions in the workplace.The Standard Indoor mirror can be angled to view a specific area, due to the fully adjustable wall bracket. For corridors with T-Junction Intersections, the Half Dome is wall mounted for two-way vision, both left and right. Also ideal for a wide angle view above store shelving. For open areas the Ceiling Dome gives a 360 degree view over shelving and aisles in department stores and can help prevent accidents at four-way intersections in hospitals and factories. Click on a Category Below for Sizes and Pricing.